Coat by Idra from Anthropologie, skinny jeans BDG, Sparkle top Vintage, Heels from Forever21,bracelet cuff brought back from India. Thank you very much for coming to my blog and writing in it. I love your blog, think that it´s amazing!!! I will follow your next updates. AH - love that coat! Love the crazy lights photography. Btw, you look model perfect. I love the blurred lights here. Thanks for the lovely comment on my blog. I think you should put those pics up, as the sound very interesting. 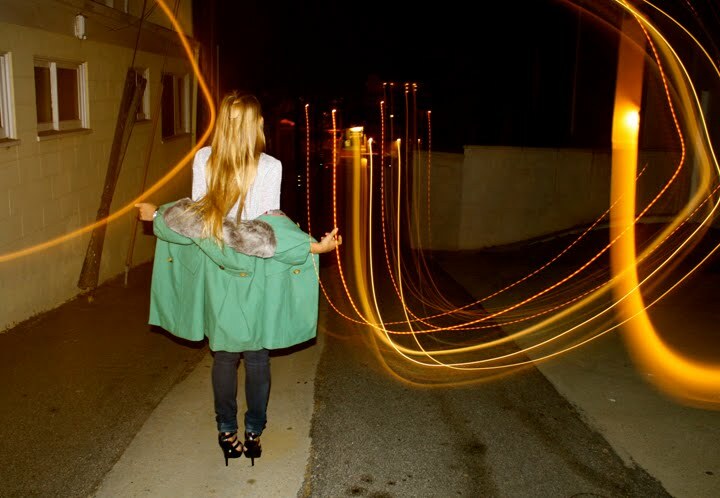 hey you got a great blog here, too bad I found it now..
great outfit...and the whole pics are such very cool. I'm in love with that minty green coat! These are amazing!!!! On Tati's other blog (sticky-note, we have links on material evidence) she tried to do some pics like this. And your outfit is so beautiful! i just really like this whole shoot. There's something about photos taken in the dark with the flash on that I really like. Again, great photos! nices picsss... i love ur trenchhh! is amazinggggggggg!! i want itt!! THANK U 4 leave a commnt in my bloggg! you're gorgeous and i LOVEEEE this outfit! Love the light writing! Fun pics. I love your coat, it's so fabolous ! U look great, like always xoxo. thx a lot. I also will study in a couple of years grafic may be photography, that's my passion. yes yes yes, so happy i'm inspiring someone! put your drawings up and let me know, would love to see what someone with an awesome blog kando. by the way, these shots are awesome, i love fu*king around with the digital camera like this! LOVE these photos, great blog!! Beautiful girl and cool outfit! And I love the pictures with the light effect! love your heels and green coat ! howd u do those light effects on the camera ?? i never manage to do them ! you are super pretty and should professionally model!! love the shoes! and the fact that they're from forever 21 makes them even cuter! Love your coat and heels!! Wow, these are gorgeous photographs. You look stunning! Go the BF for his awesome photography skills.